I made this incredibly flavorful casserole last night …. but what should I call it? Autumn Surprise? Oktoberfest Bowl? How about I call it just what it is – a Vegan Sauerkraut Casserole. Using freshly picked Apples, organic Sauerkraut, Seitan Sausages, and diced Sweet Potatoes – it truly does taste like October in a bowl! It all started with a jar of Bubbies Sauerkraut. I LOVE sauerkraut and it just so happens real, organic sauerkraut is a fermented food that contains natural probiotics. Probiotics are live bacteria that are GOOD for your health, especially your digestive system. We usually think of bacteria as something that causes disease. But your body is full of bacteria, both good and bad. And research has shown that a gut full of the ‘bad’ bacteria can lead to allergies, obesity, and even autoimmune diseases. Probiotics, on the other hand, are often called “the good” or “helpful” bacteria because they help keep your gut healthy. Probiotic-rich foods include Miso, Tempeh, Sour Pickles (brined with sea salt instead of vinegar), and Sauerkraut. So obviously we need to be eating more probiotics foods. Right? But sauerkraut? What on earth do you do with a jar of Sauerkraut? Well, my mom would have made sauerkraut and wieners (which my dad absolutely loved). Myself, I usually toss a spoonful or two on my homemade Vegan Beer Brat.…. But what else? Well, NOW you can make this incredibly tasty casserole that features sauerkraut as the main ingredient. Along with onion, celery, carrot, sweet potatoes, mushrooms, Seitan Sausages, and apple. Mmmm it’s like a little taste of Autumn! Start by sautéing some onion, celery, carrot, and sweet potato in a large soup pan. I used about ¼ of an onion, 2 stalks of celery, 2 small carrots, and 1 medium-sized sweet potato, plus a little veggie broth to keep it from sticking. Let that cook down until the liquid has almost evaporated and then add in the sausages (optional – you can leave them out completely if you want). Slice 3 or 4 homemade Seitan Sausages, like these homemade Vegan Beer Brats, or you can use Field Roast or Tofurky brand sausages but keep in mind they do contain some oil. Also add 2 ½ cups of sauerkraut, a little Apple Cider Vinegar, and a good heaping tablespoon of Spicy Brown Mustard. YUM! Season with salt and pepper and stir until everything’s combined. Transfer the contents into a 9×13 casserole dish, top it with frozen hash brown potatoes, and bake it in a 400° oven for 60 minutes or until the potatoes begin to brown. Thinly sliced scalloped potatoes would be a lot prettier on this dish, I was simply lazy and went with the frozen hash browns. There you have it. I know the photos aren’t much to look at – but my family REALLY enjoyed this dish. So give it a try, and be sure and leave those comments! 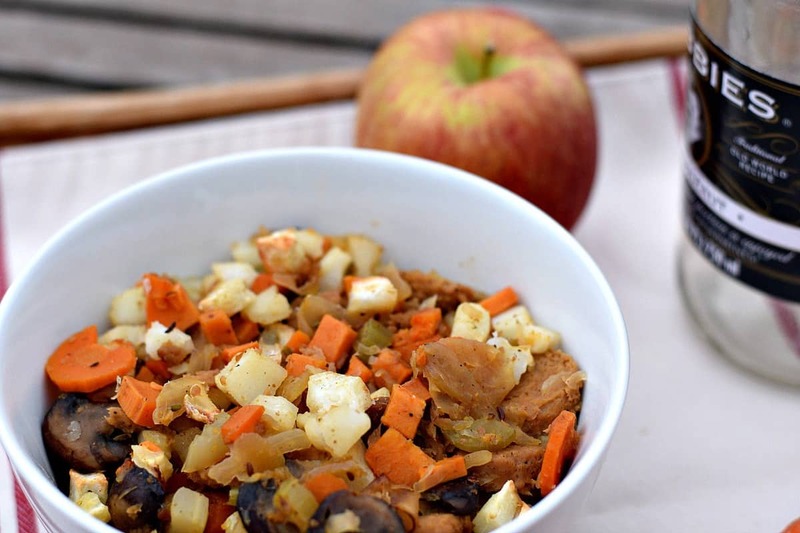 Nothing says Autumn like this Vegan Sauerkraut Casserole! Crisp apple, tangy sauerkraut, and potatoes in a spicy mustard sauce. It's like October in a bowl! This is exactly what I needed today. I’ve been on some very heavy-duty antibiotics after an intestinal abscess on a catheter I have was found. The catheter was taken out and antibiotics were given. Now I have antibiotic revenge big time. I’ll need to eat me some sauerkraut!! Thanks, as always, Chuck! Do I drain the saurkraut before adding? Baking the sauerkraut kills the bacteria. My thoughts as well. The sauerkraut also shouldn’t be pasterized.and should be organic to get the best nutrient yield. Chemicals that kill insects also kill soil bacteria as well. Less soil bateria less nutrients in cabbage. Hi Chuck, we just came across your recipe- it looks delicious! 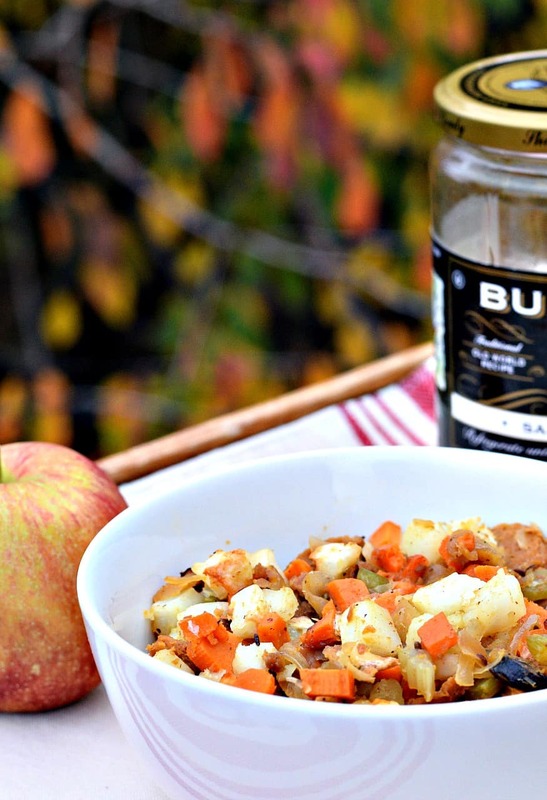 We’re so happy to hear you enjoy Bubbies sauerkraut! Love it! I have another jar ready for a new recipe next week and I JUST stopped and got some Bunnie Horseradish today to make some Deep Fried Pickles! Awesome products! This does not say how big of a bag. Does anyone have measurements for how much hash browns to add on top?